A sky-high desperation lob by Pablo Cuevas, as he trailed 4-3 in the first-set tiebreak of his second-round match against Denis Shapovalov at the BNP Paribas Open on Saturday, proved to be a turning point in a 7-6(4), 6-3 win for the Uruguayan. After they exchanged service breaks early in the set, Shapovalov looked the more commanding player as he took a 4-2 lead in the tiebreak with a dynamic forehand volley winner. He had the pressure on Cuevas when the 32-year-old Uruguayan hoisted the aforementioned lob, which looked like it might go long but landed on the baseline. Not quite prepared, after being in a position of control in the point, Shapovalov hit an overhead that ended up in the net – losing him his mini-break advantage and giving Cuevas a reprieve. Cuevas took advantage, completing a run of five points, the final one when Shapovalov misfired with a backhand service return that wrapped up the 62-minute first set – including a 10 minute interruption after the fifth game due to a light sprinkle of rain in Stadium 2. If that overhead miss was one turning point, the second was in the third game of the second set when Shapovalov had a break point but could only watch as his service return ticked the top of the net and fell back. He lost his serve in the following game to fall behind 3-1 and never really recovered – although he did have a break point trailing 4-2 that was nullified by a vicious Cuevas kick serve. “I had the match in my hands, at least the first set,” Shapovalov would say later. “I felt like I was dictating the whole time so it’s a frustrating loss for me. I’m going to try to come back stronger from it. Cuevas has a first-class kick serve, especially to the ad court, and it was a key to him winning 76 percent of first serve points (to 71 percent) and 50 percent of second serve points (to 43 percent). As sometimes happens in post-match media conferences, the topic of conversation drifted away from on-the-court tennis. The subject of Shapovalov’s long hair – a hallmark of generations of tennis champions from Bjorn Borg of Sweden to Andre Agassi of the U.S. to a younger Roger Federer – came up. “I don’t know if I have the game but I definitely have the look,” he joked when the names of those hirsute greats were mentioned. “I used to have it really long when I was a kid. At one point I went to air cadets and they told me to cut it. I had it super-short and I hated it so much. It was kind of a pain to grow it back but my best friend has flow and he kind of forced me into it. So I think some of the credit should go to my friend Johnny. With his pal Félix Auger-Aliassime having success at Indian Wells – he faces Milos Raonic in a second-round match on Sunday – Shapovalov was asked if he can take responsibility because he has been giving the 17-year-old Montrealer pep talks about being able to play at the pro level. “I’m going to take all the credit for his wins,” Shapovalov laughed. “It’s obvious how good he is – it’s not just me saying it. The rest of the world is saying it as well. I knew it was a matter of time until he broke into these tournaments and he’s doing it now. I heard he played ridiculous – I caught the end of the match with Vasek (Pospisil on Friday night). He was just really solid. He’s super-talented, he’s an incredible athlete. No matter what sport he played he would have been unreal. Peter Polansky’s 6-1, 6-4 second-round loss to Adrian Mannarino of France was quite the opposite of the flashy tennis featured in the Shapovalov – Cuevas contest. This one was all about the ball going back and fort,h and who could hang in the rallies the longest. It proved to be the crafty, left-handed Frenchman who always seemed a step ahead of Polansky until the latter rallied from 5-2 in the final set, saving four match points below going down in the one hour and 24-minute match. It was impossible not to bring up the matter of his unconventional tennis shorts, a Lululemon creation. “I wore them at Rogers Cup and a couple of times at the US Open,” he explained. “I haven’t brought them out since. I thought today was a good day for them. I try to keep updating my wardrobe with cool things. People like them because they’re a little bit out there – and especially for a match. Maybe for practice you bring them out. There’s a lot of stuff going on on them. As for his own plans now – Polansky had a wild card waiting for him for the $75,000 National Bank Challenger in Drummondville, Que. But he said Saturday evening that he was leaning to taking the week off to rest and practice in Florida before the Miami Open qualifying in two weeks. There’s no doubt it could be a blockbuster meeting of current and future superstars of Canadian tennis when Milos Raonic, 27, faces Félix Auger-Aliassime, 17, in a second-round match at the BNP Paribas Open on Sunday. It will be the fifth match on Stadium 3 after an 11 a.m. (2 p.m. ET in Canada) start – so roughly sometime between 5 p.m. and 7 p.m. ET. Raonic enters the match with a 1-3 record so far in 2018 as he struggles to come back from left wrist, calf and knee issues that interrupted his tournament schedule and training time in the second half of last year. He has been rusty so far in 2018 and could be vulnerable against Auger-Aliassime who was red-hot in a 6-2, 7-6(4) victory over compatriot Vasek Pospisil on Friday, which followed a pair of testing wins in the qualifying. Raonic has not lost to a fellow-Canadian since Pospisil beat him in a Futures event on home soil in March, 2010. Over that time he is 3-0 vs. Pospisil, 1-0 vs. Peter Polansky and 1-0 vs. Philip Bester at Challengers and ATP events. Now ranked No. 38, it will be his first match with 2001 Wimbledon champion Goran Ivanisevic (see above) as his coach. Raonic has a 17-6 record at Indian Wells – and reached the final against Novak Djokovic two years ago – while Auger-Aliassime is 1-0 (his only ATP level victory). So experience is on Raonic’s side but will his recent lack of form make him vulnerable against the free-swinging Auger-Aliassime? On the other hand – Raonic is another step up in calibre from Pospisil for the 17-year-old. It’s hard to find anyone not thinking Auger-Alassime has a genuine shot at winning, including Peter Polansky. With the emergence of Auger-Aliassime and Shapovalov, this could be the first of many inter-generational matches for Canadian tennis followers to enjoy over the coming years. Playing in his 23rd and final Indian Wells tournament, Daniel Nestor, with partner Steve Johnson of the U.S., was beaten 7-6(4), 6-3 on Saturday in the first round of the BNP Paribas doubles by the third-seeded pairing (and Australian Open champions) Oliver Marach of Austria and Mate Pavic of Croatia. The match was competitive and Nestor and Johnson led 3-2 in the first set tiebreak before Austrian/Croatian pairing asserted themselves led by some fine play by Marach. At 45, Nestor is not going to be getting any better but he held up his end admirably on Saturday and was reportedly pleased with his performance. With partner Mark Knowles of the Bahamas, he has won the title at Indian Wells four times – in 1997, 2002, 2005 (beating Roger Federer and Max Mirnyi in the final) and 2006, as well as being runner-up with Nenad Zimonjic in 2008 (Jonathan Erlich and Andy Ram) and 2010 (Rafael Nadal and Marc Lopez). Now ranked No. 72, Nestor basically needs wild cards to enter tournaments; he hopes to get one with Donald Young for the Miami Open in two weeks. The No. 3-seeded pairing of Gabriela Dabrowski of Ottawa and Xu Yifan of China reached the quarter-finals of the doubles on Saturday – defeating Nicole Melichar of the U.S. and Kveta Peschke of the Czech Republic 6-4, 7-5. Dabrowski and Xu rallied from a 1-3 deficit in the second set in a match that was a step up in quality from their opening round victory over Ashleigh Barty of Australia and American Coco Vandeweghe. Their third round opponents will be the eighth-seeded duo of Andreja Klepac of Slovakia and Maria Jose Martinez Sanchez of Spain. Dabrowski and Martinez Sanchez are former partners and there’s always a little bit of an edge when they face each other. 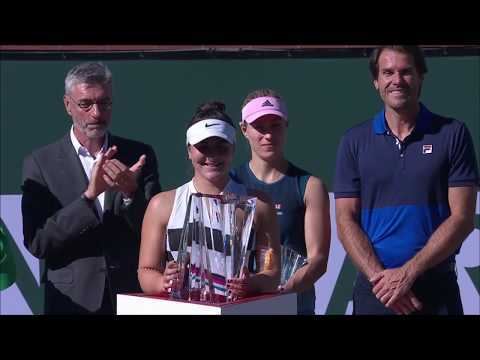 Dabrowski came out on top in the most recent encounter when she and Jelena Ostapenko of Latvia defeated Martinez Sanchez and Klepac 6-3, 6-3 in the final of the Qatar Total Open in Doha last month. The Coachella Valley, where Palm Springs, Cathedral City, Rancho Mirage, Palm Desert, Indian Wells, La Quinta etc. are located, is usually a place of relentless sunshine pounding down on the mountains around it. But Saturday was different. With some clouds drifting lower than the mountain peaks, the moisture gradually built up and rare desert rain ultimately forced cancellation of most of the evening session at the Indian Wells Tennis Garden.